Mac shipments may be outpacing the industry as a whole, but if you need a reminder it’s still a Windows world, look no further than new hard drives. The majority are formatted for PCs, requiring them to be reformatted prior to use on OS X—that is, unless you have the appropriate driver installed for native access. 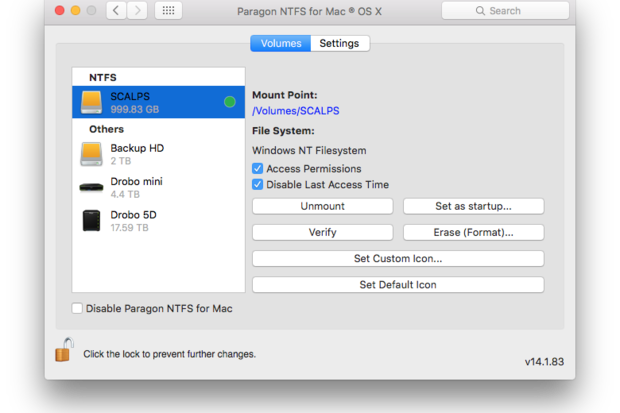 NTFS for Mac is the best such software solution: Reliable, fast, and now affordable as well, version 14 (Paragon skipped unlucky number 13) provides unlimited read/write access to hard drives, SSDs, or thumb drives intended for Windows computers. Once activated, NTFS for Mac 14 requires no settings, with automatic updates as needed. NTFS (New Technology File System) debuted alongside Windows NT 3.1 and quickly became the default format for modern PCs because of its robust file and volume sizes. 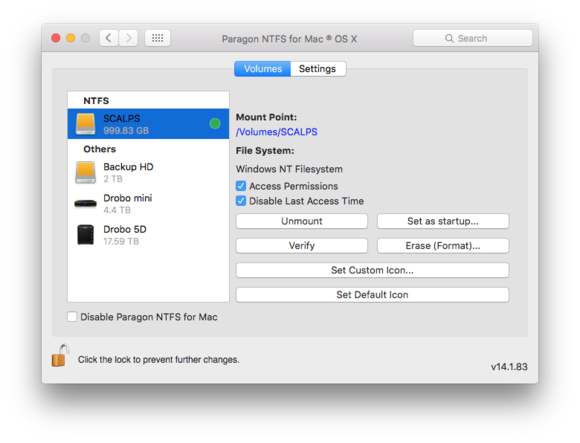 While OS X can natively read and write FAT-formatted drives, it’s a one-way (read-only) street with NTFS—that is, without a little help from Paragon. 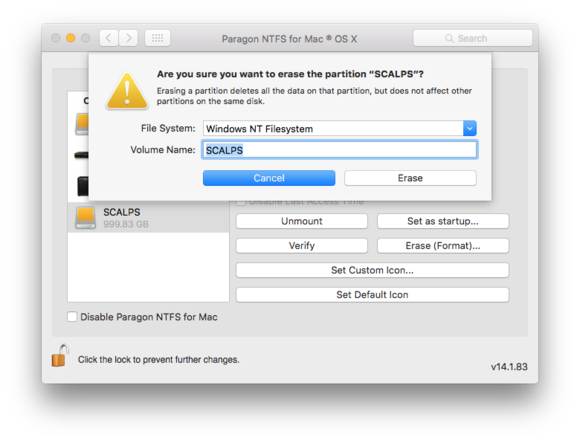 NTFS for Mac 14 installs a preference pane which enables write support. There are no settings to fiddle with. After installation and a one-time reboot, the driver seamlessly takes over whenever an NTFS volume is mounted. While earlier versions relied on Apple’s Disk Utility to format drives, the latest version relocates this option to System Preferences. The software also now includes built-in verify and repair options specially tuned for Windows-formatted volumes. 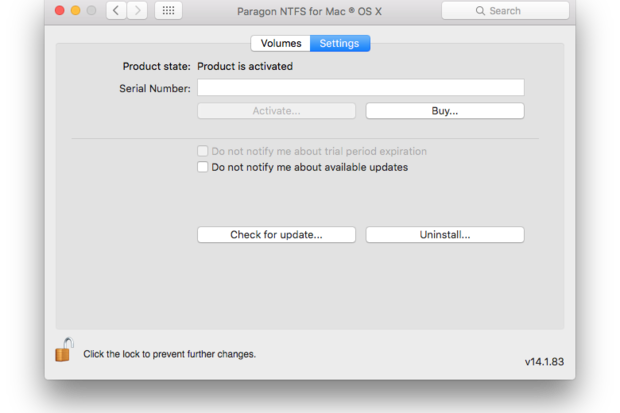 Paragon relocated the format option to System Preferences, and also threw in new options to verify or repair NTFS volumes. Although NTFS for Mac has always been a convenient utility worth owning, it was typically slower at writing than native OS X volumes. At nearly $40, the software was also expensive for Mac users who required infrequent write access. I ran Blackmagic Speed Test to see how NTFS for Mac 14 fared against a native OS X drive. Using a 1TB portable hard drive formatted OS X Extended, Speed Test clocked 104.2 megabytes per second (MBps) read and 104.8 MBps write connected via USB 3.0 on a mid-2012 Retina MacBook Pro. After reformatting as NTFS, that rate increased slightly to 105.7 MBps read and 106.5 MBps write. In my experience, NTFS for Mac 14 is virtually indistinguishable from using native OS X volumes. A follow-up test copying 43GB via the Finder clocked in at 6 minutes, 26 seconds, a full minute and a half less than the initial eight-minute estimate. 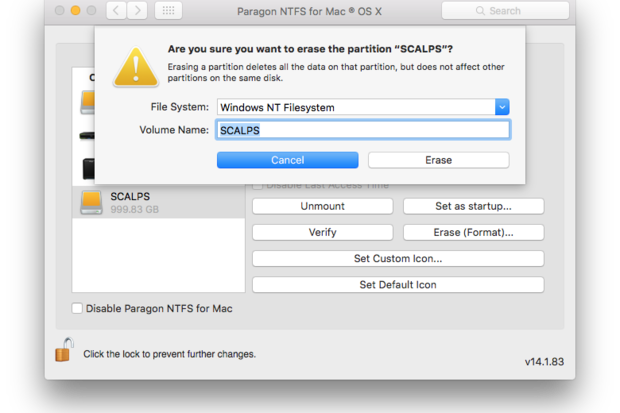 The only potential downside is that annual paid upgrades are required for full compatibility with newer OS X releases, but Paragon typically offers these at a 50 percent discount. The NTFS for Mac system preference shows which volumes are being controlled by its software, but everything happens seamlessly in the background. 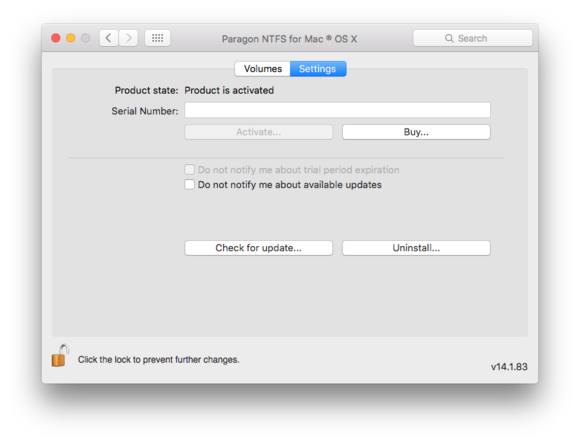 Fast, seamless, and easy to use, Paragon NTFS for Mac 14 is required for those who need to write to Windows volumes. And now it’s more affordable than ever.